After a few nights in Lombok, provisioning and having laundry done through the marina, we took off on September 28th for a quick, 6-hour sail to the island of Bali! Just like Tahiti and Bora Bora, Bali is not a country, it is an island. Bali is a major holiday destination for tourists, especially from Australia, but it’s not even a top 12 province by population in Indonesia. While everyone in Bali speaks Indonesian, they also speak Balinese. Therefore, when you are being polite, you can use either suksma (SOOK-suma, Balinese) or terima kasih (TI-era-ma-KAH-see, Indonesian). Mostly, though, everyone knows at least a bit of English thanks to the heavy tourism. Throughout the rest of Indonesia, the only thing people have been really pushy about has been selfies – they LOVE taking selfies with us. In Bali, commercialism has crept its way in and we were often bombarded by hawkers trying to sell their wares or taxi drivers. They are very pushy, even going so far as to lie to you. Once they know you, they call your name: “Amy, your husband said he loves this!” or “Yesterday you said you would buy something today!” It’s annoying, and requires a combination of polite disinterest or even just ignoring. We picked our way through the small mooring balls and local jukungs to find a spot to anchor. The only other boat here was one we had watched on YouTube many times but never met – Sailing Catalpa! This was our first black sand anchorage too. The black sand makes it very hard to see the bottom, no matter how clear the water is. It is disconcerting trying to anchor in it. The anchorage is fairly unprotected from anything with an N in it, so we only planned on staying two days and suffering through the swell. Black sand beach and Starry Horizons. I did go to shore to take a break and walk around. Amed is pretty dirty – as in lots of trash on the streets and in the plants – and really caters to backpackers. 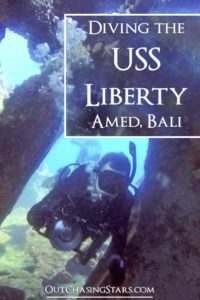 The big task to accomplish was to dive the USS Liberty – our first wreck dive! With all of our gear loaded up, we took off for an early morning dive with the crew of Catalpa – two dingies with six people and all of the necessary equipment. It was a half hour ride over to the wreck site, and thank goodness Catalpa led the way, otherwise, we would never have found it ourselves. Dinghying to the USS Liberty Wreck with Mount Agung. Despite the early morning, there were still heaps of people suiting up and walking into the ocean to start their dives. 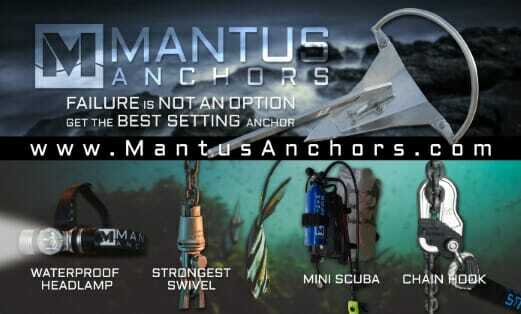 We anchored the dinghies and hopped overboard for a fantastic dive. It’s always nice to have someone else to dive with because then we get pictures of us! After our second REALLY rolly night in Amed Bay, we sailed 47 nm west to Lovina Bay. While Lovina does still get a bit of a roll, we were able to tuck behind a reef that extends and curls around the bay. We arrived just after the last day of the rally, so many of our friends were there, but we missed all the activities (which also means we missed the really loud music on the beach playing through the wee hours of the morning). Lovina is pretty nice – still typically Indonesian with the trash all over the streets and lots of cheap hostels everywhere, but it also has a more upscale side. I suspect that Lovina is the best anchorage on Bali, with access to services and good holding and protection. The main feature of Lovina (aside from the black sand beach) is the dolphin statue in the main square. It’s quite the tourist attraction but also leads out on the main roads. There is a large pier, but unfortunately, at low tide, it is both too shallow and too tall. It’s perfectly good to use at high tide though. The best option, if you are able to, is to take your dinghy up anywhere on the beach. Lovina was a perfect stop mid-way through our time in Indonesia. Bali is a good place to provision, and it is readily accessible in Lovina. Just 200 feet off the beach is the Pepito Supermarket, with tons of imported and domestic products. It had by far the best meat selection we have seen in Indonesia. Imported items (or gourmet items from Bali) were expensive, but meats and produce seemed to be reasonable. There is a traditional market for produce about a 10-minute walk from the dolphin statue. 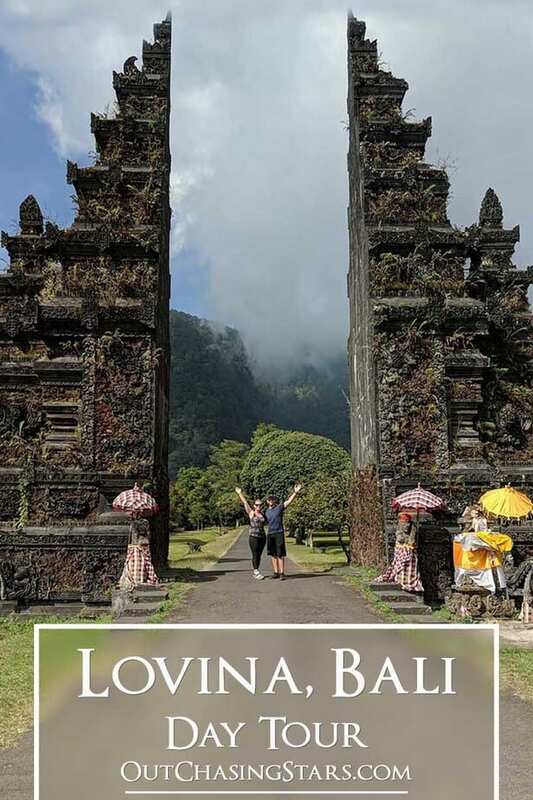 Wanting to explore the interior of Bali, David and I hired a car and driver to take us on the Lovina Tour. We booked through La Tour Lovina, which is located right by the dolphin statue and was the official local representative for the rally, and we paid 650,000 Rp ($43 USD). Immediately upon arriving at the Gitgit Waterfall parking lot, we were approached by a local guide. They have a spiel – the money goes to the kids, and yes you can walk Gitgit by yourself, but it’s better with a guide. 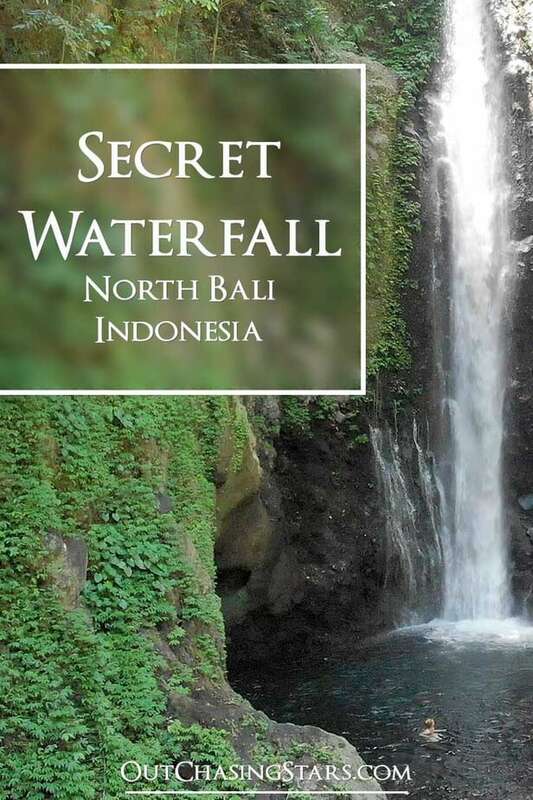 Well…hiking and waterfalls are some of our favorite things, so we splurged and hired a guide to take us not only to Gitgit but also to Secret Waterfall. We are VERY glad we did! Our guide was very informative, pointing out a lot of the vegetation and edible plants. Secret Waterfall is appropriately named – its hard to get to and when we arrived we had it all to ourselves. This waterfall is big enough to really swim in and it is secluded and quiet. A bamboo bridge on the way to Secret Waterfall. Downstream is Gitgit Waterfall, which wasn’t crowded but had a handful of tourists with us. Plus, the water is not deep enough to swim in, you just wade around. Both waterfalls are beautiful and great photo opportunities. David and I at Gitgit Waterfall. Our guide was fantastic too. Since we have our big cameras, it’s obvious we are filming video. Our guide really got into it, suggesting shots and staging us. The biggest negative was that after the waterfall you walk through a gauntlet of tourist shops selling everything from spices to Hard Rock Cafe Bali tee shirts to sarongs and towels. This ended up being a very consistent part of our day. Our guide led us to a stand where he introduced his wife and I did buy two packages of macadamia nuts, which I probably overpaid for, especially since our guide then bought me some jackfruit from a nearby stand. What another nearby waterfall option? Check out Sekumpul Waterfall. Our driver took us up into the mountains of Bali from here. It was such an interesting car ride – the air gets cooler and more humid, clouds are covering the mountain tops, and the area is fertile for agriculture. In this area, locals grow everything from tobacco to strawberries. We stopped and had a basic Indonesian lunch overlooking the mountains and fields. On the shore of Lake Bratan lies a famous temple dedicated to the Hindu lake and river goddess Dewi Danu. This temple underlines the importance of agriculture in central Bali – the lake is the primary source of water for irrigation. The lake is 1200 m above sea level and has a cold tropical climate (which is an oxymoron) with clouds usually hanging low over the lake. The Ulun Danu Beratan Temple. The gate everyone tries to pose with. The temple was built in 1633, the temple is very popular with tourists. Our visit was crowded but despite that, several people tried to block off areas to get that perfect picture of them all alone in the temple. The grounds of the temple were beautiful, with a nicely manicured lawn and bright flowers. Unfortunately, they also have a mini zoo, with several animals in captivity just waiting for a tourist to pay for a photo shoot. Back on the road, I asked our guide to stop at the entrance to the Handara Golf Resort for a photo opportunity with their beautiful Balinese gate. I had recently read about taking photos at other gates – long lines and high fees. We paid 30,000 RP ($2 USD) each to take photos and have the gate all to ourselves for 10 minutes. Next, we climbed even higher, up to the viewpoint between the Twin Lakes – Lake Buyan and Lake Tamblingan there are several photo op setups with swings and bamboo hearts and sky bridges. We opted to skip the props and just take an old-fashioned selfie up at the top. Swing out over the Twin Lakes. Panoramic view of the Twin Lakes. This was my least favorite stop. Our guide explained that there used to be a lot more rice terrace, but now buildings have taken over the land and the production is not quite what it used to be. A better stop would be the Jatiluwih Rice Terraces, a UNESCO heritage site south of the lakes, or the Tegalalang Rice Terraces. The rice terrace is not much to look at from the ground, but you can see the drone footage is pretty cool. Our last stop was the hot springs. I’ve only been to a few before, and this was pretty standard; there were three pools of varying warm temperatures, cold fresh water showers, changing rooms and lockers. The hot springs close at 6 pm, and we were one of the last people to leave. After piling back into our car, our driver cheerily said: “ok, now off to the Buddhist temple!”. At this point, it’s 6 pm. David and I look at each other and say “yeah…I think we are ready to go home.” I expect that the temple he was ready to take us to was the Brahma Vihara Arama, very near the hot springs. Knowing what I know now, perhaps I would have ditched the Munduk rice fields and the hot springs for the Jatiluwih Rice Terraces. But, all in all, it as a great tour and we had a wonderful time getting around the north parts of Bali. Lovina is a solid anchorage to leave your boat and travel ashore, visiting places like Ubud or Denpasar. Catalapa left their boat for a few days to stay in Ubud. We took a day trip to Denpasar to the FedEx office (to mail our ballots, yay!). For a day trip to Denpasar we paid 600,000 Rp ($40 USD). Seabreeze – Good food, but my mojito was terrible. Live music was fun and the meal was a moderate cost for two people (roughly $30 USD). We dined here with Kimi and Trevor on October 6th, their last night in Bali, celebrating my birthday. Spice Beach Club – expensive but fine dining. A two-course meal with cocktails for two people came to 900,000 Rp ($60 USD). We dined here with Kyle and Shelley from Blowing Bubbles on my birthday. Drinks at Spice Beach Club in Lovina. I got, as a birthday gift from my in-laws, two massages while we were in Lovina. One was an in-and-out massage at the very eclectic Santhika Bed & Breakfast (an upgraded massage for 200,000 ($13 USD)). The other was a half day affair at Banyualit Spa ‘n Resort Lovina Bali. I enjoyed the use of the pool and a non-alcoholic beverage before entering a private outdoor spa with a waterfall, massage pagoda, hot tub, and bath. The facilities were stunning, I didn’t see any other guests, and it was the best massage I have gotten in Indonesia. Since we came via our boat, Starry Horizons, we didn’t need accommodations, but we saw some interesting places while enjoying the town. All of the places mentioned have good reviews. There are a variety of backpackers hostels in the Lovina area. Typically beds are available for $8-25 USD at places like Santhika Bed & Breakfast (where I went for my massage…eclectic, quiet, and the staff was very accommodating) or Funky Place Lovina, more of a party spot. Spice Club Bali has rooms available for let which look very nice, as does Banyualit Spa ‘n Resort Lovina Bali. Palm Living lists villas in Bali, and private villas can go for as little as $74 USD a night for 3 bedrooms! Basically, there’s plenty to accommodate every budget in Bali! It’s easy to imagine coming to Bali again since it is such a big tourist destination. People really seem to love Ubud, so hopefully, next time we find ourselves in Bali we will spend a few nights in Ubud. We have no plans to go to the Philippines on the boat for that reason. Too risky! We are glad you are enjoying the blog posts!